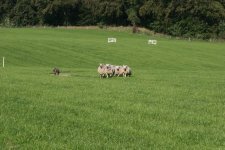 First kennel in Denmark with qualifying score on Sheep, ducks and cattle! (now 12 dogs) and to become WTCH! We breed Aussies for working and spare time. 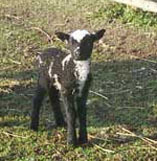 3 head of Hereford (expencive hobby)! Then one of them got a calf and we had 4 cattle. 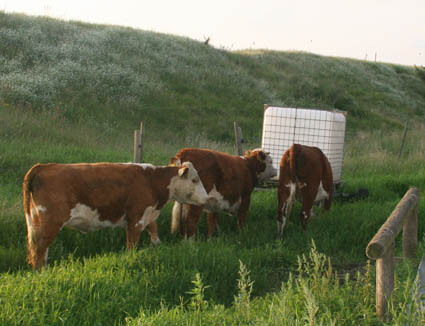 Then we borrowed a bull and we had 5 head of cattle. And next we got a black/white cow and had 7 head of cattle! Hyrd.P WTCH JJ CHip . 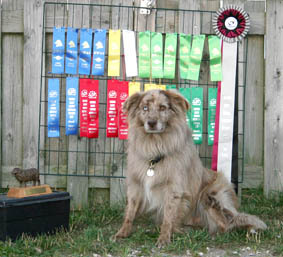 He got his Working Trial Championship! 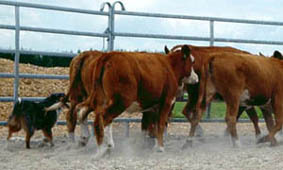 Shadow OTDsd STDc (1 leg Open cattle). He won Open sheep/ducks! CHap STDcsd (1 leg ducks/cattle. He won started cattle! Marble STDs (1 leg sheep) with Nicole from Australia Congrats!!!! Windy STDs with Gitte from Denmark Congrats!!!! Tipi OTDs STDcd (1 leg ATD s) with Camilla Congrats!!!! 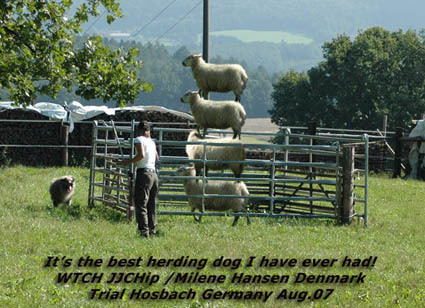 "CHip" won HIGH IN TRIAL Sheep (HIT) and Aussieligaen "Tipi" MOST PROMISSED STARTED AUSSIE. 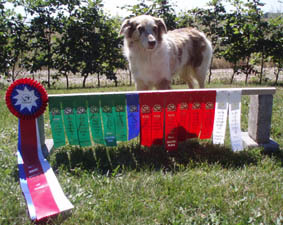 Sep. 23.-24 06 CHip got no 9 out of 24 Border Collies to the Danish Mastership in herding. Click photo to see more from the Event! You can see our dogs by clicking on the basket "our dogs"
See more of Dundé STDsdc by clicking here. See more of HYRD.P WTCH JJ CHip clicking here. I'm very happy to finish his WTCH!!!!!!!! Dundé is 7 y.old before the first working trial in Europe. CHip is only 9 m.old! 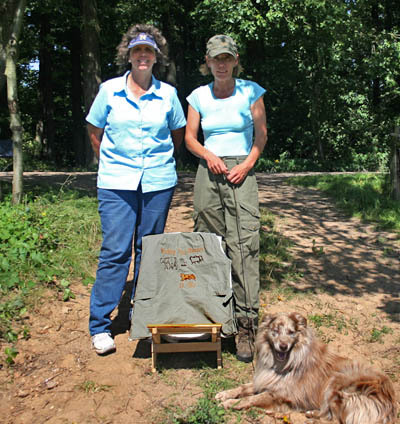 Kennel Ligaen are breeding "Aussies" which are suitable for work and leisure. 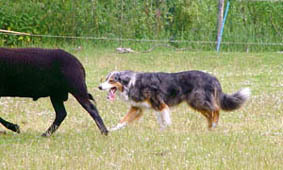 All our dogs are tested on sheep, and in their descent are several American Stockdog Champions. The Aussie loves to work with stock, it is most content, when it is allowed to use it's shepherd instinct.Some Aussies have got enough strength and courage to tackle cattle. 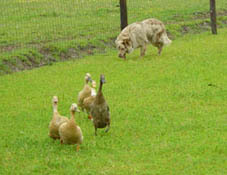 The puppies instinct, can be tested in an early age on ducks. One of our puppy owners keeps dwarf rabbits in the lounge room and they try to get through the glass slidingdoor to get into another room. The owner constantly has to chase the rabbits away from the slidingdoor. The puppy saw this and in the first 2 -3 days, the puppy then started on it's own to keep the rabbits away from the door. The puppy was only 8 weeks old! 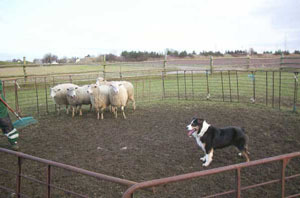 It is important for a sheepdog to learn it's "down" practice at an early age and to have the right leadership. We recommend you to go to puppy training. If you train your dog right the first couple of years, you will get a good dog for the next 10 - 15 years. We'll gladly in getting your dog trained. 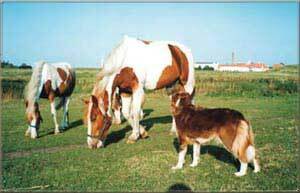 I have breed working dogs the last 22 years. 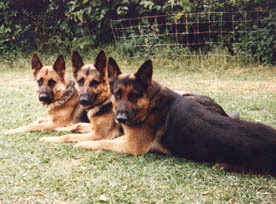 I started with German shepherds where I obtained high points and qualification to DM, in "The Danish Police Dogs Association", "The German Shepherd Club" and "Denmark's Civil Dog handler association". 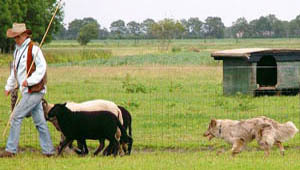 I'm educated as trainer, I have trained and breed some of the best service dogs here in Denmark. 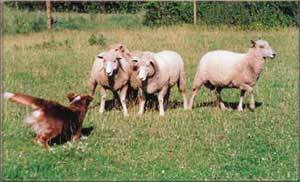 I'm still learning about herding, which it's new for me. I want to go to herding trials more often. 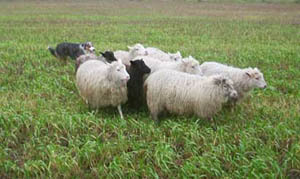 To get started to work your dog, you need a roundpen or scarepen and some dogused sheep. Next 4 photo's "Cot" is starting to learn. You have to move yourself against the dog and away from the dog. This is Ligaens Newflash Navajo "Ronja" 4 month. She's working fine the first time. 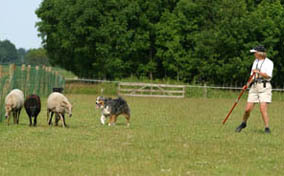 Click on the IKONS to go for herding rules or play to be a shepherd!